Exponents is pleased to introduce three new portable and custom-portable exhibit products: Prestige, PopStar and Panorama, available immediately for delivery. Prestige™ allows easy reconfiguration to meet changing display needs. For over 28 years, Exponents has enjoyed a reputation for industry-leading product innovation. In its continuing efforts to provide exhibit solutions, Exponents is pleased to introduce three new portable and custom-portable products. Prestige™ - A custom-portable exhibit solution that is ideal for customers who want the convenience of a pop-up system, yet require increased functionality, flexibility and style. Prestige consists of a system of modules that allows clients to enlarge or reduce their exhibit’s size or reconfigure easily to meet changing display needs. With Prestige, exhibitors always have the perfect showcase for their company and products, no matter what booth size. The Prestige system will also accommodate client custom designs available directly through local Exponents dealers. PopStar™ - A modern take on a classic design. PopStar is a stable, self-locking pop-up exhibit featuring an invisible panel mounting system that won't interfere with a client's graphic message. 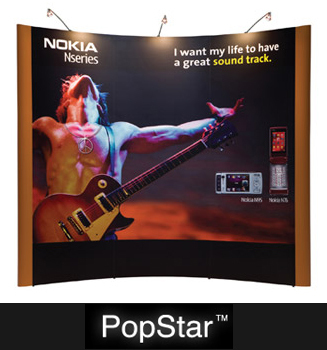 PopStar is among the world’s most popular pop-up displays. Its Swiss design and engineering are without peer. Panorama™ - A stunning fabric wall with minimum weight, maximum impact and astonishingly fast assembly. Its lightweight and durable display frame combined with large-format color print on seamless fabric is especially well-suited to events and in-store displays. Panorama is transported in a luxury sports bag. Prestige, PopStar and Panorama are high-quality systems. All three provide great value and all are protected by a lifetime warranty for the original purchaser. Developed by Expo Display Service in Switzerland, an Insta Worldwide Group Company and sister company to Exponents, the three systems have been sold successfully throughout Europe for many years. Now they are available in North America exclusively through Exponents and its network of professional designers, dealers and distributors. The trio of new systems can now be viewed in the company’s website products area (http://www.exponents.com/products.shtml.) Additionally, Exponents' eCatalog also includes the latest product information on Prestige, PopStar and Panorama, as well as showcasing a variety of designs that make the most of these systems' unique capabilities. Full-color product brochures are available for download or through any Exponents dealer. Download Prestige exhibit product brochure. Download PopStar exhibit product brochure. Download Panorama exhibit product brochure. Exponents is one of North America's most highly respected custom-modular exhibit designers and manufacturers. Thriving on innovation, the company has won numerous awards while helping its clients to achieve their trade show goals for over 28 years. Exponents became part of The Insta Group in October 2009. Visit Exponents at http://www.exponents.com. The Insta Group provides global exhibit solutions and offers an extensive range of innovative products and services to help customers achieve their objectives at exhibitions and events around the world. Based in Mumbai, India, the company currently employs 550 people and has operations in 11 countries on 4 continents. Visit the Insta Group at http://www.insta-group.com. Press Release: Exponents Announces Three New Exhibit Products: Prestige™, Panorama™ and PopStar™ PopStar™ exhibit system - A modern take on a classic design. 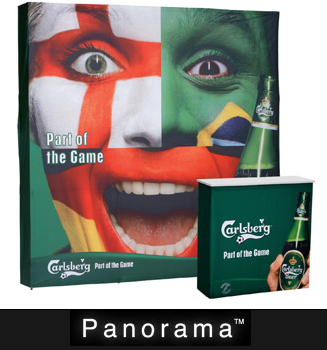 Panorama™ exhibit system - minimum weight, maximum impact and astonishingly fast assembly.